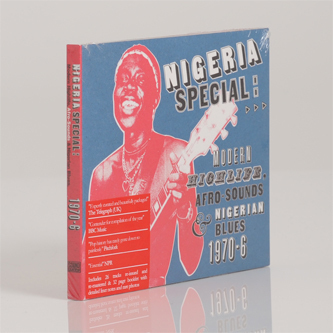 As this compilation on Brighton's Soundway label adeptly illustrates, Nigeria in the 1970s was a melting pot of different cultural influences, both from African sources and the wider influence of music from other corners of the world - most notably jazz and blues. This double-disc sized compilation draws together 26 tracks that have never before been reissued, offering a unique slant on how we think about Africa's contribution to what has previously been termed world music. As we'd hear on tropicalia recordings from Brazil in the '60s and '70s, musical hybridity and cultural cross-pollination is not the exclusive property of 'western' artists, and these recordings offer multiple examples of how the conventions of highlife and afrobeat intermingle with sounds you just wouldn't automatically associate with Nigerian music. Take for example the American-style deep funk of The Nigerian Police Force Band's 'Asiko Mi Ni' or the languorous, jazzy Hawaiian guitar slides of Celestine Ukwu and His Philosophers National. Elsewhere, the curiously named Semi Colon lays down a freewheeling, bluesy guitar solo and Leo Fadaka & The Heroes experiment with dub-style studio techniques - all kinds of influences seem to pour into this compilation, revealing Nigerian popular music to be no more immune to the bombardment of external influences than any other strain of pop anywhere else in the world. Incredible compilation.